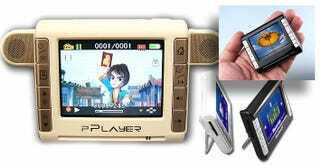 The Cavalry Pocket Player Multimedia Device is probably not a media player you'll be showing off to those you would like to impress, but even though it only costs $120 it looks like it might be able to get the job done anyway. It plays back MPEG-2 and MPEG-4 movies as well as MP3, it's a mini DVR that can record audio and video, and it has an FM tuner on board as well as 512MB of storage. If that's not enough, you can add up to 4GB removable storage. Just 16mm thick, its 2.5-inch LCD packs in 960x240 pixels, and its AV recorder can lay down 30 frames per second at 640x480. It even has a little kickstand in the back for easy viewing, and you can add a couple of mini-speakers as well. Looks like a lot of player for $120 but the pics have us a bit concerned—some have a logo, some don't and some even look like there's a different logo on the front. Proceed with caution; you usually get what you pay for.